Ecurie Ecosse began their 2013 British GT Championship campaign with a pair of strong finishes at Oulton Park yesterday (1 April). The Ecosse duo of Oliver Bryant and Marco Attard quickly got to grips with the Barwell Motorsport-run BMW Z4 GT3 to take a fine sixth place in the first race of the day. Attard maintained his qualifying pace and after a solid and consistent stint handed over to Bryant in eighth position. Bryant then engaged in a thrilling battle which saw five cars fighting for third place. 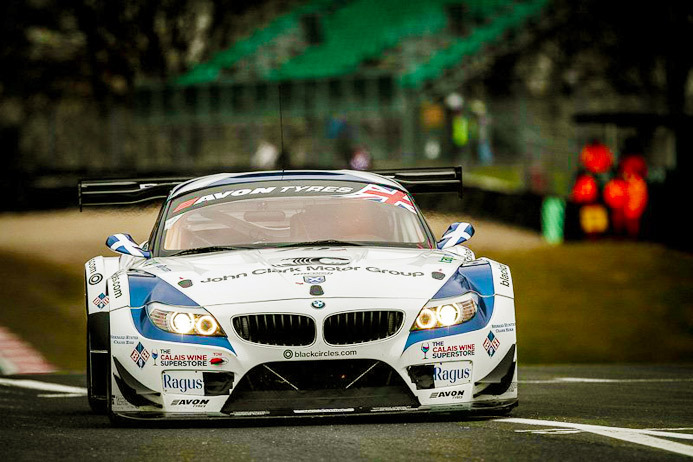 Ragus sponsored Ecurie Ecosse GT3 takes 3rd at Oulton Park. Following an off-track excursion caused by contact from Alan Simonsen in the Rosso Verde Ferrari 458 Bryant set about making up for lost time, consistently lapping quicker than those in front on his way to a strong sixth place overall finish. Race two was equally competitive. Bryant started and lost touch with the lead pack while battling with Rob Barff (Ferrari 458) and Joe Osborne (BMW Z4 GT3), but made up a huge amount of time with a very impressive ‘in lap’ and speedy pit work from the Barwell crew. As things settled down Attard emerged in sixth spot. After making more progress the race was neutralised for a car on fire, bunching the field up. With two laps to go the safety car came in and Attard drove fantastically. After a superb pass on the Jay Palmer Ferrari he took third overall, a performance that netted him the coveted ‘Mobil 1 Driver of the Weekend’ award. Ecurie Ecosse now lie third in the championship following the first two rounds and were consistently the fastest BMW throughout the weekend. The sister BMW Z4 GT3 driven by Piers and Ron Johnson under the ‘Ecurie Ecosse with Barwell Motorsport’ banner finished 16th and 17th in the two races, maintaining Ecosse’s 100% finishing record in all the events in which the team has entered since it was reformed in 2011. The next rounds of the British GT Championship take place at Rockingham on 6 May. Before that the team turns it’s attentions to the opening round of the European Le Mans Series at Silverstone (13 April) where the car will compete for honours in the GTC class driven by Ollie Millroy, Andrew Smith and Alasdair McCaig.